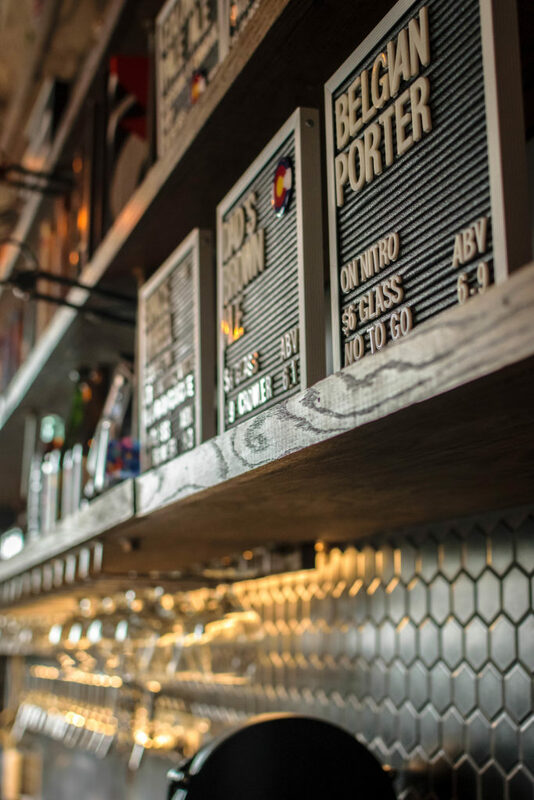 You are here: Home / Hoppy Thoughts Blog / In Denver the Beer Party Starts Early: Our Mutual Friend Brewing Co. Hosts its Fourth Annual Gratitude Celebration. 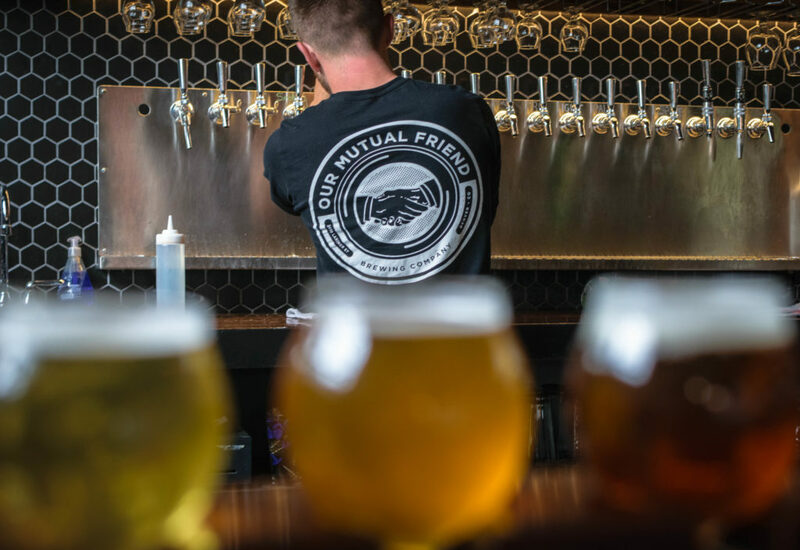 In Denver the Beer Party Starts Early: Our Mutual Friend Brewing Co. Hosts its Fourth Annual Gratitude Celebration. The rain finally let up in Denver’s River North neighborhood. As I walked down the damp sidewalk I neared Our Mutual Friend Brewing Company. I could see the crew was utilizing the lull in the weather to give the brewery a facelift. Paint cans, brushes and rollers all laid out on the sidewalk, employees setting the front of the brewery awash in a mural of colors. The makeover wasn’t happenstance, in just two days from 2pm to midnight on Saturday, September 30th Our Mutual Friend will be hosting its annual event; Gratitude. A celebration set a week before the Great American Beer Festival I popped inside of OMF to see what was in store this year. I found Jack manning the taps behind the bar. With a smile and a handshake he wasted no time in pulling out a neat row of taster glasses. Under shelves lined with an eclectic mix of succulent plants, shed deer antlers, and old books I saw that despite a limited menu, OMF still had some of my favorites on tap. Cascade, a hop forward session ale had its familiar hop bite with light and refreshing notes of fruit and citrus. Always crisp and always balanced I’m glad it was still on the menu. Space Wheel, a double IPA mixed a wide range of hops to bring out full and loud flavor. Citra, Simcoe, Mosaic, Cascade, and El Dorado hops were all brewed into this double to give my taste buds a wild ride. As I sipped my beer Jack filled me in on some details about this year’s event. The celebration sounded like the perfect kick-off to GABF week with $4 pours, food trucks, music and free merchandise give-aways, including an exclusive glass made just for Gratitude. “Would you like to see it?” Jack asked after mentioning the glass. He pulled it out from some unseen bottom shelf and placed it on top of the bar. Vibrant and colorful, the glass was indeed a work of art rivaling the mural of colors currently taking shape on the brewery’s face. It wasn’t long before I was introduced to Michele Garrett, OMF’s intrepid taproom manager. Entering through the front of the brewery with a modest splattering of blue paint on her clothes, she wiped at some of the paint between her fingers before shaking my hand. We jumped right in and started talking about Gratitude. The sentiment behind Gratitude was one that completely embodies the OMF philosophy. A brewery born around the concept that brewing, tasting, and sharing beer brings people together. For OMF the social atmosphere created by the camaraderie of people gathered around good beer was what it was all about. This belief is illustrated in the very logo of Our Mutual Friend Brewing Company, a circular image of two people shaking hands. I asked Michele about the tap list and what she was most excited for. “We’ve got a special Guava Saison that’s delicious.” she said, “Sur Framboise is one of my favorites, too. A Belgian Sour Wit with Raspberries.” I scribbled down some of the names on a notepad. “Of course there’s Double Dang, too, an awesome double IPA.” she continued. “Double Dang?” I asked, pausing to make sure I heard right. In addition OMF also would be rolling out several collaborations for the event. Working together with folks from Trophy Brewing Company out of North Carolina and Oregon’s Fort George Brewing Company as well as Denver locals Spangalang Brewing Company. 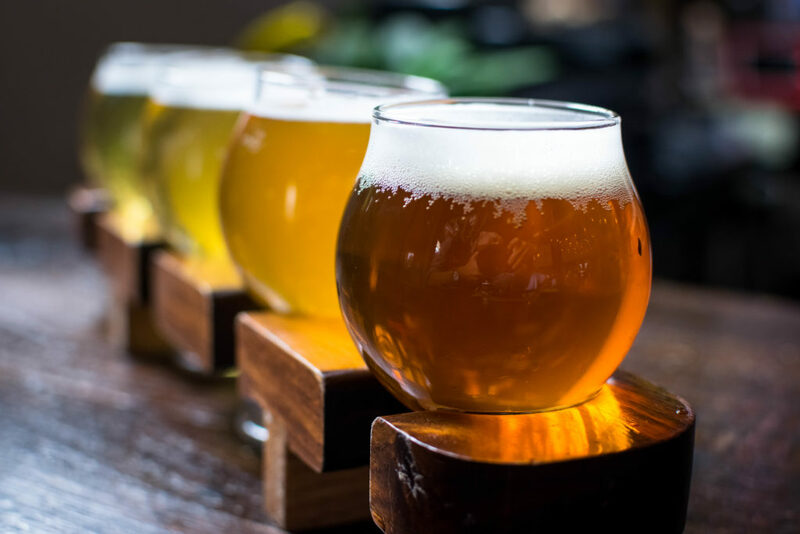 Impressed with the scope of OMF’s 4th annual Gratitude I asked Michele how the brewery would be preparing for the Great American Beer Festival less than five days after Gratitude. “If you had one word to encompass that whole week, Gratitude and your time at GABF what would it be?” I asked. Michele stopped and thought for a moment and then smiled. Filed Under: Hoppy Thoughts Blog Tagged With: beer, brewery, Colorado, Craft Beer, Denver, GABF, Great American Beer Festival, hops, IPA, microbrew, Our Mutual Friend Brewing Co.